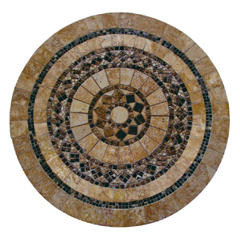 The tables below are all crafted from a variety of natural stone materials, intricately cut to fit together into the exotic patterns shown here. 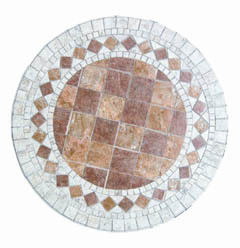 Each pattern is then available in your choice of size and shape arrangement, allowing you to craft the perfect small table for your kitchen, or any room of the house. 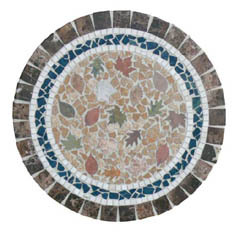 A brilliant collection of multicolored leaves formed from intricately cut pieces of natural stone, with the entire table bordered with a slate frame. A precise design, bright blue points spread out across a stony white backdrop, giving a sense of depth to a table top which is already alive with the soft texture of natural stone. 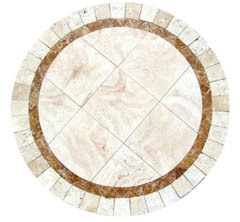 These unique tables can be crafted to almost any custom size and shape that you like, allowing you to fit the piece into almost any setting, or perfectly mold a table into the architectural embrace of the kitchen itself. Red blushing tones burst subtly through a stony white gray backdrop, like hints of dawn breaking over an ancient palace courtyard. 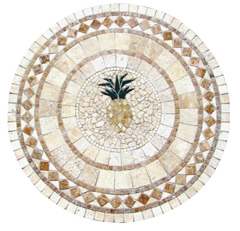 Impressive natural stone decorative pieces. 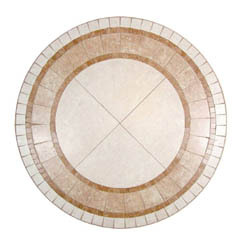 Simple design is made complex by rich shadows which lay across the light tan colors found in these unique stone table tops. Crafted to your size specifications. 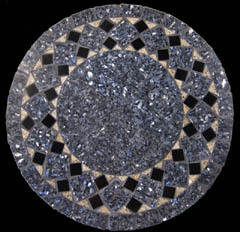 Brilliant multicolored blue speckles abound across the surface of these exquisite tables, broken by deep blue diamond pattern seeds which align themselves in an array around the central dial. 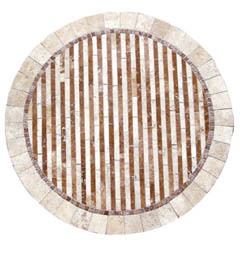 Rows of rough brown travertine stone run rings around the center of this table top design. At its core, a star burst radiates outward in a dual colored design. 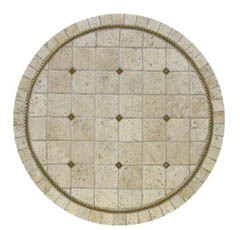 Customize this table to your exact specifications, round, square, oval, rectangular, and match it up with your choice of optional stone mosaic table base to create the perfect piece for your kitchen. 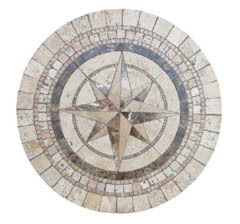 A brilliant star burst pattern explodes from the central core of this natural stone table. The multitude of natural colors is enhanced by the effect of radiating borders which loop outwards across the surface of the design. All of these kitchen tables can be used in either an indoor or outdoor setting, allowing you to create an attractive, elegant cooking space wherever you like. 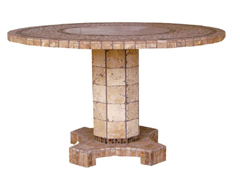 All of our tables can not only be customized to your exact size and shape specifications, but can also be outfitted with an optional umbrella hole, and or an illuminated onyx ring. 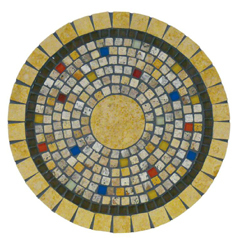 Brilliantly colorful mosaic stone pieces are arranged in a cobblestone pattern, surrounding a stone yellow pendant core. 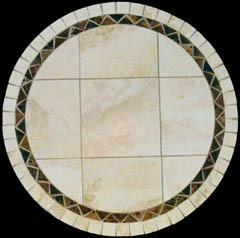 The entire effect is enhanced by the matched outer ring of the piece. 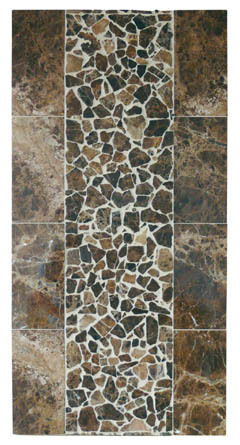 Deep brown tones wash lazily across the surface of these elegant natural stone tiles, broken occasionally by the gentle rumbling of white hot lightning, which chaotically slips across its surface. 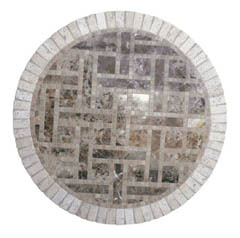 Maze like trails of mosaic intrigue twist and turn their way across the earth toned surface of this intricate kitchen table, creating an intriguing effect that invites you to stare ever deeper into its pattern. 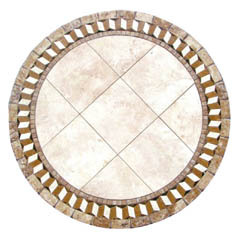 Soft white cloud like tiles lay across the center of the table in a crisscrossed pattern, surrounded by deliberately placed stone chips, which create a dimensional border surrounding the entire thing. 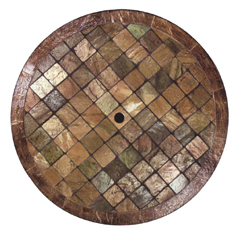 Stunning copper tones wash across the face of this multi stone mosaic design, creating a shimmering wall of merging colors and tones, all of which combines to form a truly one of a kind table top design. 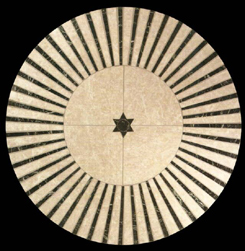 A star point center radiates outwards in alternating bands of blue and white, creating a unique pinwheel effect which is quietly mesmerizing when you star into the face of the table. 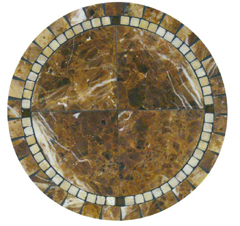 Using tiny pieces of broken stone, a mosaic design is formed across the surface of these delightful kitchen tables, adding warmth and beauty to any space where they are used. 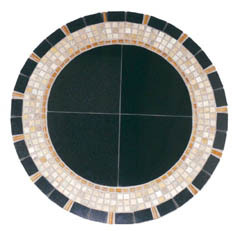 Black midnight tiles sit amid a crest of beige colored chips, forming a dark hole pattern which is made more powerful by the contrasting light and dark tones found in the natural stone. 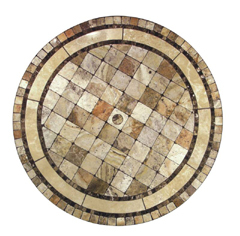 Stunning broken chip tiles set in a line amidst two flanking borders of multicolored material makes this table resemble a river bed flush with stones. This look is enhanced by the fact that the materials used in its construction are all natural, mountain born pieces, which still retain some of the strength and dignity of that illustrious heritage. 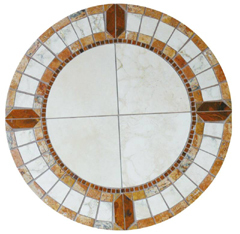 This kitchen table design can be built in almost any size and shape you need by our team of design experts, allowing you to craft the perfect piece for any environment. 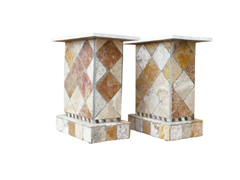 These tables are also rated to be used both indoors and outdoors, so you can set up a kitchen wherever you like. 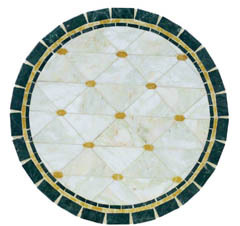 Further customizations include the ability to have an umbrella hole pre-drilled, and the ability to have an illuminated onyx ring installed on the border of the piece. 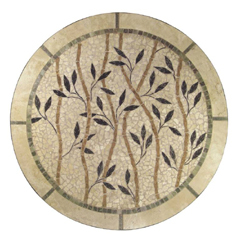 Tiny stone pieces are meticulously arranged to create a scene of vines and buds, sprouting across the surface of this enchanting table, reminding you that spring is always just around the corner. 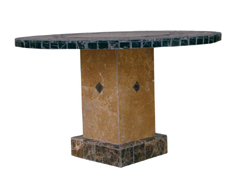 All of our kitchen tables are built using a highly durable, light weight, space age material, which makes these pieces considerably less heavy than a pure stone table would be. 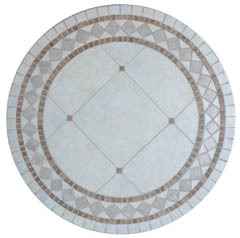 Mild beige tones are the hallmark of these elegant natural porcelain kitchen tables. 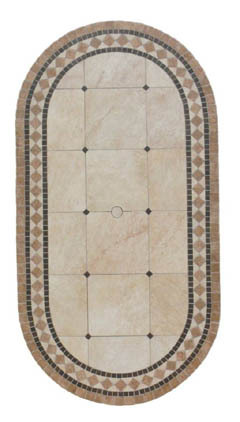 The soft tans and earth tones create a warm, rich feel which inspires thoughts of home and hearth, making a space feel perceptibly more inviting. Rusty red earth tones dominate the style of these attractive tables, casting a quaint, wholesome spell across a space, recalling simple days of good food, good friends, and the basic pleasures of life. 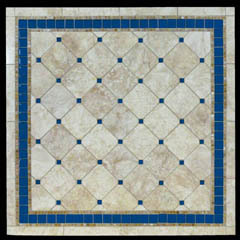 Mild white tones are broken by vaguely hued brown and gray cream colors, presented in points and lines, and then bordered with a lovely diamond pattern. Deep rich colors suffuse the surface of these porcelain kitchen tables, creating a musky overtone, that casts a warm dignity over an area. The deep hues found in the material tend to draw the eye in, causing you to instantly take note of the piece. Our entire collection of kitchen tables can be crafted as large or as small as you like, to fit whatever your spaces needs are. 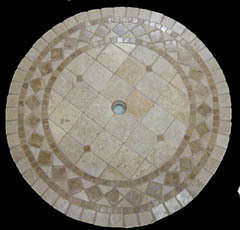 We can also craft them in round, square, oval, rectangle, or any custom shape you would like. 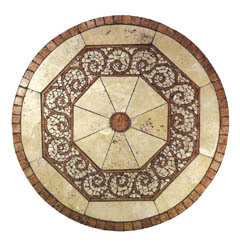 To enhance the look, a matched natural stone base can be purchased, which will be crafted with the same colored stones as the top, completing the masterpiece as one unified whole. 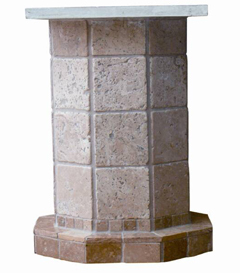 Options such as an illuminated onyx ring, and an umbrella hole for outdoor use are also available for every table that we offer. 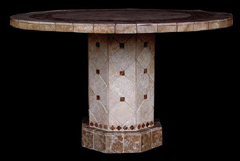 All of our table bases are crafted from stones designed to match the pattern of the table top you choose. 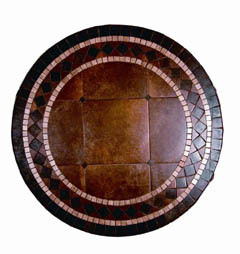 You also have the option of coupling your table with any standard frame or base.